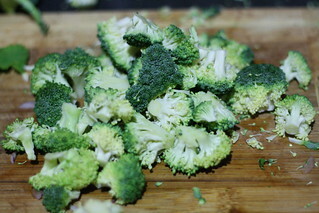 Broccoli though very healthy i buy this very rarely as kids will not prefer to eat this. 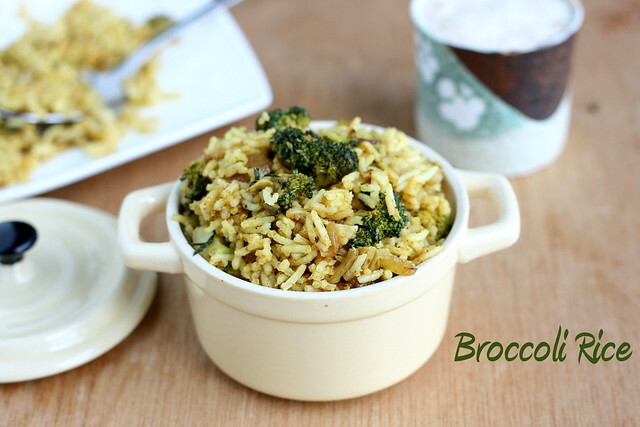 I normally make a Broccoli Soup or Broccoli stir fry but this wanted to try a rice recipe with broccoli and made a Indian style Broccoli rice . 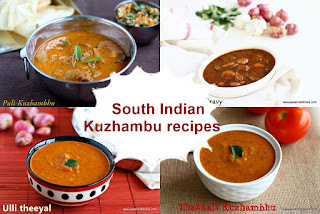 This is almost similar to my recipe of capsicum rice. 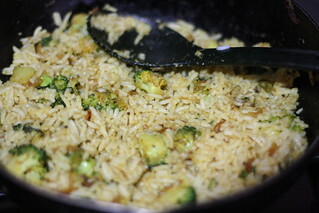 Me and my hubby enjoyed this broccoli rice and some how kids also had a little. 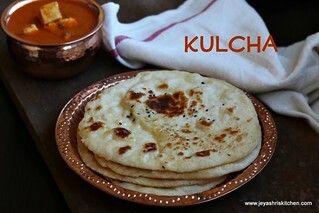 You can make this for lunch box too as this can be done in a jiffy. Wash the broccoli florets and keep it aside. 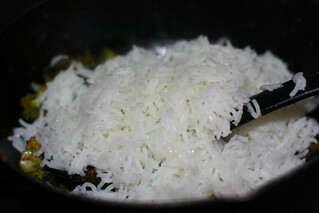 Fluff the rice with fork and allow it to cool by spreading it in a wide plate. In a pan add oil and add in the ginger garlic paste. Saute in a low flame till the raw smell goes. 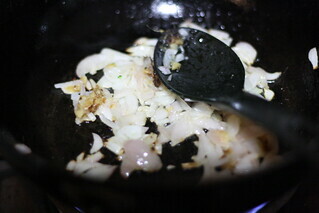 Add the thinly sliced onions and saute till they turns into nice golden brown colour. 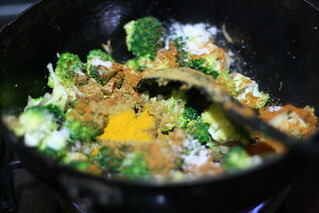 Now add the broccoli florets and add the sambar powder,turmeric powder, garam masala and salt. Saute in a medium flame for 5 to 7 minutes till the raw smell of the masala powder goes off. The broccoli should be crunchy. 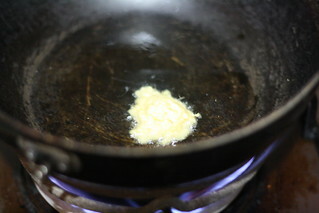 Switch off the flame and add this mixture to the rice. 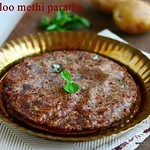 Gently mix it well and garnish with coriander leaves. 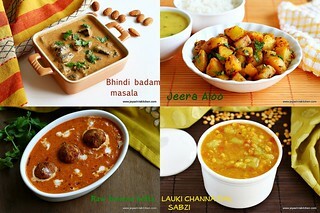 Serve with any raitha of your choice. 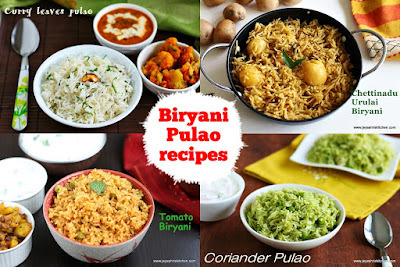 You can add chopped capsicum or green peas to the rice . If adding , add after the addition of broccoli. 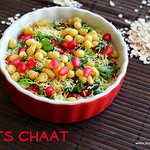 1-2 tblsp of chopped mint leaves can be added in the beginning to enhance the flavor. You can add peanuts after the ginger garlic paste is done. 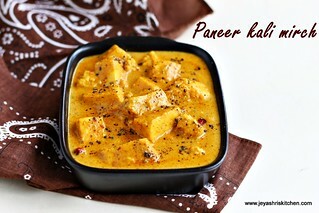 wow..so well prepare Jeyashree...love the beautiful clicks.very healthy and love the colour. 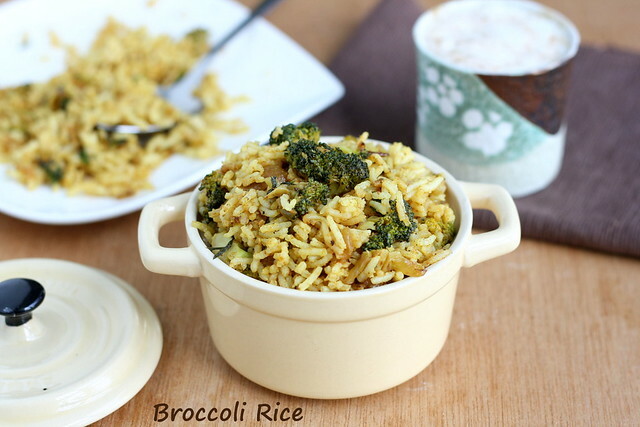 Love broccoli in any form, this rice sure sounds quick, healthy n delicious...for lunch box too! Sounds different and healthy one pot meal. 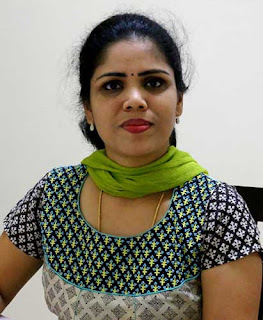 its handy know? well presented ! Nice twist with Broccoli! Healthy meal! 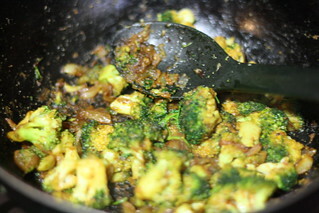 very nice and easy recipe with broccoli.... but how abt the taste? Healthy meal with simple ingredients!!! considering the health benefits, i'd say this is a great way of incorporating broccoli into our diet. Never tried this before,, thxs for sharing..looks nice & yummy..
sounds too interesting.. will give a try..
Looks so good, healthy one pot meal.. 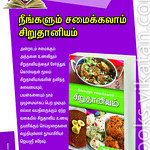 Healthy rice, wat a better way to sneak this antioxydant rich veggie. 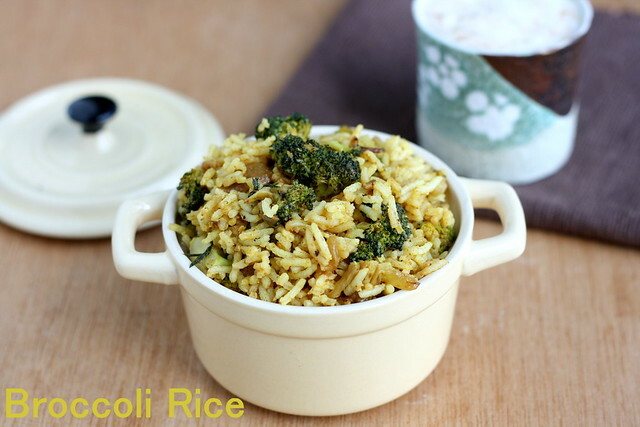 Simple and easy to make healthy rice. Looks delicious. Broccoli is my daughter's favorite. Must try this sometime for her..
Nice variation rice...looks absolutely tempting! Ultimate one pot meal. Very tasty and was totally surprised. Didn't expect it to turn out this tasty. We easy to make and worth trying. We cherished it. Thank you very much!! !